It's easy to spot the first big addition, which occurs on the Albums page. 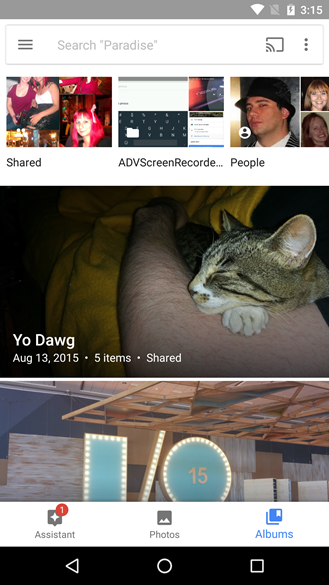 There's a new "Photos on device" row that points directly to photos grouped by their location in local storage. This change should improve visibility of the local images and may eventually remove the need to keep a link in the navigation drawer – it seems a bit out of place now that the three main pages have been relocated to a bottom nav bar. The other huge change on the Albums screen is a shift from a list of full-bleed cover photos for each album to a 2-column list with shrunken images. The text previously overlaying the cover photos has been moved below each album. This will certainly cut down on the amount of scrolling we have to do if there are a lot of albums, so the advantage is quite clear. 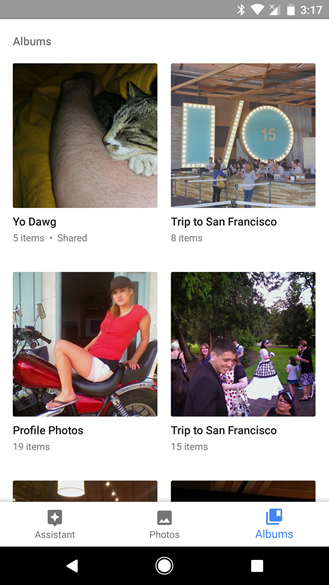 As the screenshots above also show, the square crop does tend to be better suited to some photos. However, the new screen also introduces a lot of whitespace and I immediately miss the wide crops. Finally we come to the new "Device folders" screen. 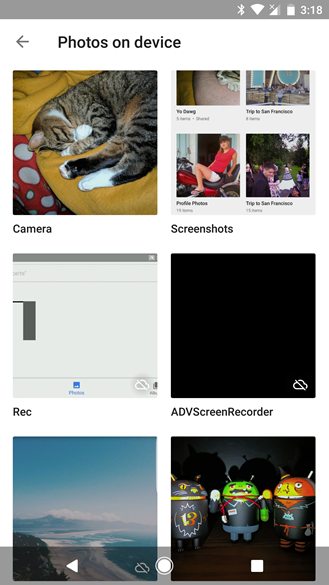 It still bears that name in the nav drawer, but the screen itself has been renamed to "Photos on device." 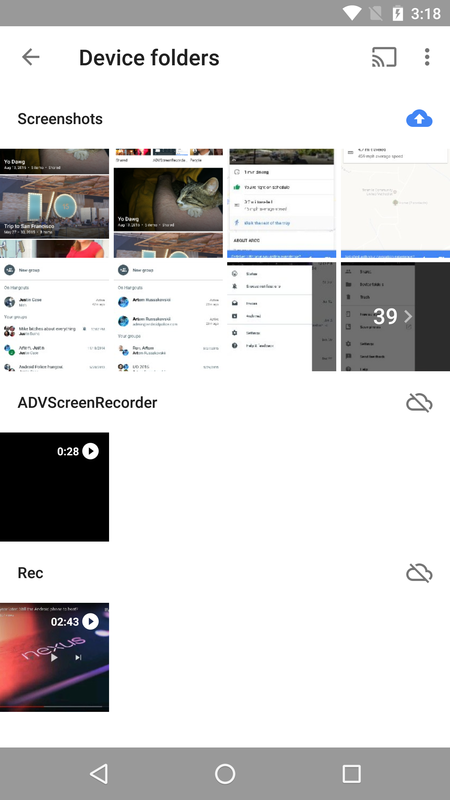 The same 2-column layout has been adopted and the cloud backup indicator now overlays the cover images for each folder. 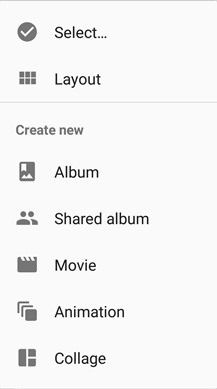 If you like some of the story-style albums Google creates automatically, it looks like you're going to have the ability to initiate them on your own instead of putting all of your expectations on Google to figure them out automatically. A new option called Auto-stories is going to be added to the list of things you can create (pictured below). 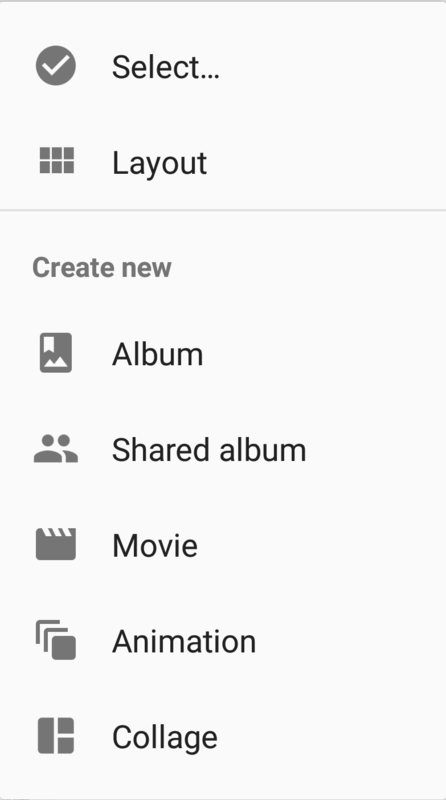 When it goes live, the new option will be positioned between Shared album and Movie. The function of auto-stories seems fairly predictable. I expect it will ask for one or more photos or videos that go together, and possibly pick out more automatically. After a little bit of quick processing and maybe some clever algorithm work to figure out which things are linked, it will organize a story view with location maps, dates, groups of related photos, hashtags, and whatever other clever bits may be appropriate. After a very long period of testing and refinement, Google launched Nearby as a way to conveniently broadcast and communicate with the various devices around us. That happened back in June of last year, but aside from a few interesting apps and experiments in the early days, adoption seems to be pretty stale. Nevertheless, Google Photos is about to put it to good use as a new way to share with other people. An addition to the SendKit interface, which was advertised as a faster way to share, now includes additional elements to feature possible share targets provided through Nearby. There's not much to say about the evidence itself, nor much to guess about in regards to features. 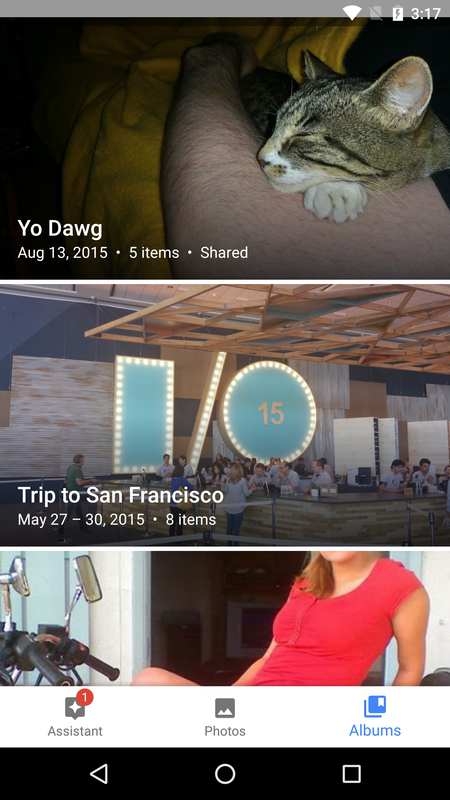 Quite simply, Nearby results are going to appear in the share menu at some point in the future. The obvious advantage of Nearby will be that you can share photos with people close to you without having them in your contact list or screwing with either Wi-Fi Direct or Bluetooth (both of which are awful to use manually). Just think, you can send group photos on the spot to that random couple you met at the restaurant or receive shots of you petting a dolphin from somebody with a waterproof phone without giving them an email address. 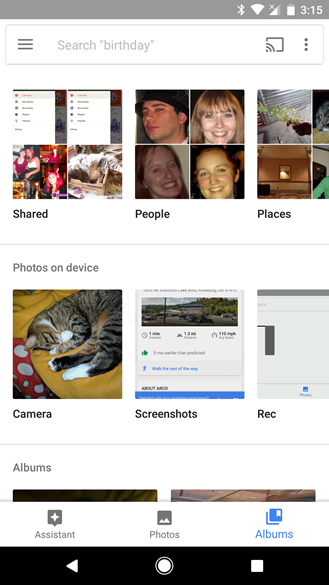 Most of us won't have to use Nearby to trade photos very often, but it'll probably be really great in those instances when it saves us from screwing around with other methods. Also, since I've seen a handful of other apps make the switch to SendKit for their sharing mechanism, I have a feeling Nearby will turn up in those, as well.